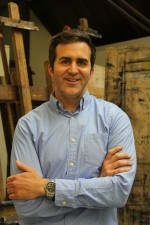 Miguel deBaca is an Assistant Professor of Art History at Lake Forest College. He received his PhD from Harvard University and obtained his Phi Beta Kappa Key from Stanford University. What first attracted you to the world of art? I entered Stanford intending to major in International Relations, then I switched to Materials Science and Engineering, and I eventually ended up in American Studies and Art History (so as you can see, I was on a bit of a roller coaster). What is your favorite course to teach and why? My favorite course to teach is The Art of the Sixties, not only because the tumultuous 1960s have been a period of my sustained interest throughout graduate school and my early career, but also because students have a real enthusiasm for the material (particularly the radicalism of the later 1960s). Why did you decide to write a book about Anne Truitt? The first time I saw artwork by Anne Truitt was at the Museum of Contemporary Art, Los Angeles in 2004, right as I was at a point in graduate school that I had to decide on a subject for my dissertation. I was completely amazed by her work: so muscular, austere. I recognized a presence there that other Minimalist artwork simply hadn’t had for me, and it excited me intellectually. My book, Memory Work: Anne Truitt and Sculpture, grew out of my dissertation; it will be published by University of California Press in January 2016. Has it been any more or less difficult than you first anticipated? You attended universities on the east and west coast. What brought you to Chicago? I came to Chicago to teach at Lake Forest College. I have always had friends in Chicago, so I knew something about the city by the time I moved here. Chicago has always struck me as a place that is both elegant and approachable. The Art Institute is truly second to none, which is a huge benefit to me! How did you find out about the PBK Chicago Association? Lake Forest College has a PBK chapter, and I became involved with PBKACA through the campus group.